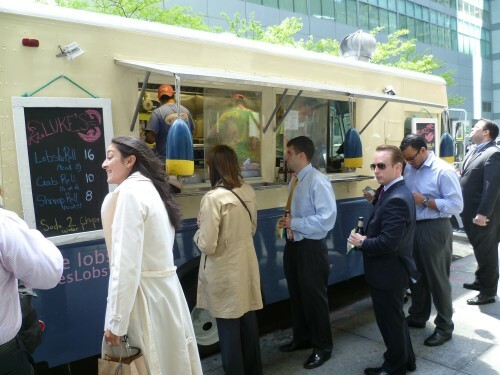 As I waited in line at Luke’s Lobster Truck Monday on 52nd and Lexington, I heard constant chatter of people walking by saying things like, “Luke’s Lobster has a truck here? ?” “Oh, I love this place!” ”I wish I hadn’t already gotten my lunch!” Excitement was in the air and not just from those of us who decided to brave the line on Luke’s first day out. I too have been a fan of Luke’s since they opened their first location in the East Village about two years ago. Before that, the only time I really had lobster rolls in New York was at a restaurant and it would cost me between 20 and 30 bucks. Luke’s changed the game when they started selling lobster rolls for a measly $14. That was unheard of for a delicacy like this in an expensive city like NYC! And amazingly, Luke’s lobster wasn’t some finely chopped, mayo drenched monstrosity. This was the real thing! But how would it work in Midtown, the neighborhood where 10 dollar lunches are king? Considering I’ve never seen any single menu item at a food cart or truck costing above 10 bones, I was hoping for a markdown. But when I arrived and saw that the full lobster roll costs $16 (a dollar more than their current store menu! ), I was worried this would be the tipping point, opening up the gate for more expensive mobile menus. In order to keep this a true Midtown Lunch, there are only four options: order a half lobster roll for $8 (which wouldn’t even fill up a minnow), stick to the crab or shrimp roll, or get lunch somewhere else. I decided to splurge a little bit and ordered a half lobster and a half crab roll. 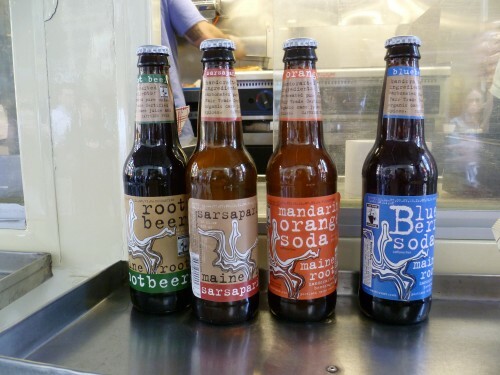 And I couldn’t resist a bottle of Sarsaprilla root beer (even though I still have trouble pronouncing it). The guy on the truck then asked me if I would like a free bag of Salt and Vinegar chips, which I thought was rather a silly question. Evidently, they’ll throw in a bag of chips with the purchase of a full roll and a drink. So the damage was $14, which wasn’t too bad considering I got to practically taste their entire menu. The two rolls were side by side – both stuffed into a toasted and buttered hot dog roll. Lengthwise, they were pretty small. Yet fresh, beautiful crustacean meat overflowed from the top. It took some finessing to hold all the meat in the sandwich. But I love that even after I licked my fingers clean, there were still some lobster segments at the bottom of the container left for me to savor. Not surprisingly, these rolls are just as good as the ones at their brick and mortar locations . The lobster and crab are practically untouched. There’s just enough added (a slather of mayo, squeeze of lemon butter, and a dusting of secret spices and herbs) to intensify and complement the natural deliciousness of the shellfish. I prefer the meaty richness of the lobster to the flaky sweetness of the crab, although I would eat both every day if I could afford it and cholesterol wasn’t an issue. So, it’s possible to maintain the Midtown Lunch price point and get a delicious taste of Luke’s serious lobster rolls. The only problem is it probably won’t be enough to fill you up and the sandwiches are so fresh and tasty, that it will most likely have you clawing for more. 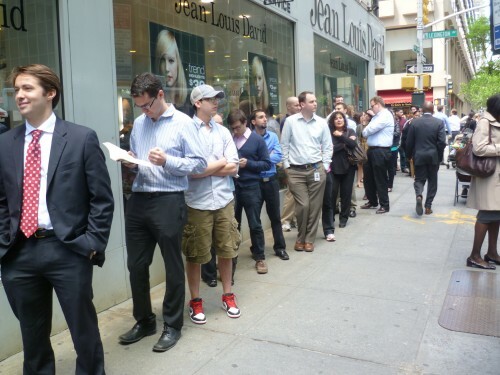 And based on the literal talk on the street, the lines will only get longer. Don’t say we didn’t warn you. 16 BUCKS for lunch?!? From a Truck?! Luke’s took the day off yesterday, but will be back today. They’re planning to park on 46th btw. Park+Lex but you’ll want to follow them on twitter or check the ML Twitter Tracker for specifics. Posted by brianhoffman at 11:30 am, May 11th, 2011 under Luke's Lobster Roll. Regarding the price difference: the $15 price for a lobster roll at the store locations doesn’t include sales tax, which pushes the roll up to $16 and change. So the truck price (which includes the sales tax) is technically a little cheaper! Makes sense. I hadn’t thought of that. You just got me really excited for the brick and mortar location to open in the FiDi (sales tax be damned)! I stood in line and spent $16 for Lobster on Monday and ended up spending another $10 at Mexicue 2 hours later. Anyone else notice that the guy taking your order makes some sort of winking gesture when he gives you change? The only reason I bring this up is because I noticed that he did the same thing to the guy who ordered after me. I just thought it was a bit odd….perhaps he was fishing for a tip? I am very excited to try this! Those pics look AWESOME! 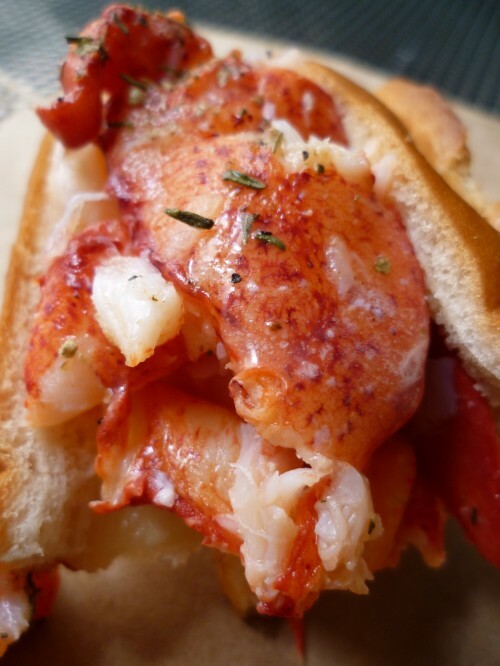 save $6 and 45 minutes and get a lobster roll at Urban Lobster Shack nearby…805 Third Avenue (49th/50th Street. $10 for a lobster roll, includes a side salad or a bag of Cape Cod Chips plus a small cole slaw. I tried it with a Urban Bundle for $5. It was good. Not as good as Luke’s (I’ve been to the EV branch), but just a suggestion if you want to stick to your midtownlunch budget and save lots of time for a nice walk in the beautiful weather. i used a bundle, too. the taste was fine, but despite the add’l items, i was left hungry afterwards. have never been to any luke’s location, so i have no basis of comparison. Is the urban lobster roll as hearty? If so, I will just hit that up…. I seem to think it was the same size. Don’t hate on me if it isn’t. :-) But you get stuff with the urban lobster one (slaw, chips or salad). That said, Luke’s roll is delicious! outside midtownlunch price range, but really good. The Urban Lobster roll isn’t as delicious, but it is nearly half the price, and a good deal at $10 (or $5 with a coupon)! Just offering options…. Luke’s is bigger (assuming same portions in UES and EV locations) than the Shack, and also better tasting. But for $6 extra, I guess you get what you pay for. The line is free. I’m a bit sketched out by the Shack, as it’s literally a hole in the wall in a basement…first time I was there I walked past it twice without seeing it. Guess Urban Lobster Dungeon didn’t have the same ring to it. There were no customers at all, so I paused at the thought of the potential freshness, but I didn’t get sick. It’s a tic! Gets worse in the spring (allergies?). I swear I’m not creepy. Thanks to all for the kind words and can’t wait to see you out there soon. Mmm seafood heaven on a bun. It looks really good. Though not everyone can be forkin’ over $16 for lunch and standing in lines forever but it does look like it’s worth a occasional splurge. @bconniff – thanks for letting me know that you weren’t just being creepy. You were all very friendly and from reading the bios and blog on the main website, it sounds like a fun place to work. Luke’s is my favorite and I am excited for the FiDi location. I recently had the Red Hook rol and it was very good, but Luke’s use of choice meat versus an over use of mayo still takes the cake in my book. BUT urban Lobster Shack is also a good roll and a great deal. And the owner is super nice. they used to have a nice store on the corner of Houston and A in the E. Village and they would deliver lobster dinners. Glad too see they are still around in one form or another. I finally hit the Luke Lobster Truck. I think it’s slightly bigger and better than Lobster Lb. More lobster meat with Luke’s, and really no trace of mayo that I could find, which is a plus. I would do Luke’s again, maybe not every week, but certainly once or twice a month. I got to try this truck a few weeks ago. Thankfully it was a cold day and there was a very short line. I really liked their lobster roll. I liked it more than Red Hook. I liked the seasoning on it. It really added a lot, but in a subtle way. The price went down from $16 to $15, but they charge tax. 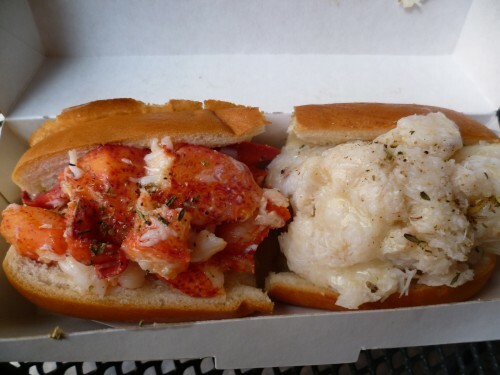 My problem with Lobster rolls is that they are expensive for very little food. Yes, the Lobster was good, but it’s not a very filling lunch. That means lunch costs even more by the time I find something to supplement the meal. Still, it’s worth a visit if you want to splurge on a little food.